Is Rift Pay to Win? When any game goes free to play or adds a cash shop, players start to get worried. In some cases, these games turn in to what we call “pay to win,” or games where those players with the most cash are always going to have a better benefit than those who wish to earn everything in their game, without the need for throwing real life cash in to it. Rift recently made its move from a game based on subscription income (monthly fees) to one that is free to play and based on money earned through the cash shop. As a result, long time players (such as myself) were worried that the game would end up being set up in such a way that it caters more to people with cash than it does to those without (as they need to earn money from somewhere to keep the game going, right?). Luckily, at least as of right now this has not been the case. Let us take a look at the cash shop to get a better understanding as to why it is a somewhat hybrid pay to win game, while at the same time it is also still pretty equal overall. Rift uses its own credit system for in game transactions. This is actually pretty common among games that implement cash shops, as it keeps there from having to be a ton of really small charges on credit cards, and at the same time it allows the game publishers to sell cheap items (sometimes at the cost of mere cents, rather than having to focus on only the more expensive things). Rift is no different in this regard, however they do something that is a bit different than a lot of other games. In the majority of free to play games, you are only able to purchase store items if you paid for them. You are not even able to trade these items to other players, so there is no alternative to getting a hold of them. Some games, such as TERA, change this by allowing you to buy items and then trade or sell them directly, but even that has its limitations; if someone has almost enough currency for the item they want, they are forced to buy more or just let the credits sit around gathering dust. This is, by far, the most awesome system I have ever seen in a free to play game. It is sort of like taking the best part of Star Trek Online (where there is what is called a “Dilithium Exchange,” where you can trade one of the game's currencies for their cash shop currency) with TERA (where nearly anything on the shop can be traded once it is bought). It is hard to put in to words how surprised and happy I am that Trion decided to do this, but it really is an amazing step towards opening up free to play games to everyone, and I hope that other publishers are paying attention and decide to follow suit in the future. This is where things do start to get a little controversial. When it comes to the Rift cash shop, there are tons of things that are available. In fact, a majority of the items you can buy in the game with your normal gold can also be bought using the credits instead. But is this really such a bad thing? For anything that has no real structural value (that is to say that it does not grant a true advantage over another player that does not happen to have those items, such as bag space or character slots) it is hard to argue that there is anything wrong here. Those items do not affect the equality of gamers in the least, so there really should be nobody against them. Things do start to get a little hairy once we move in to the gear section, though, where tons of items can be bought with the credits instead of having to farm for them. As a direct example of this, we have the PvP gear sets. While some tiers are not available (such as the top tier), many others are (like the second to top). Of course, what one must realize in this case is that regardless as to how many credits you have, you still have to meet the other requirements of the items as well (such as level, Prestige rank, notoriety with different factions, or anything else the item would normally require). In this sense, there really is not such a big problem because when it really comes down to it, those players have already earned their way to getting those things; the only real difference here is that they are choosing to trade their cash shop credits for the items they want instead of giving up their gold or Favor. In other words, while these items are most definitely structural in that they do give an undeniable benefit over players that do not have the same things, the players that are able to purchase these things off the market could have them already regardless as to whether or not they were ever added to the cash shop. All that is happening here is they are being given more choices as to how they wish to purchase it, rather than being forced to use a single method. The same thing really comes to the gifted items. Anything that has a requirement of notoriety, Prestige rank, etc. before it can be obtained can not be gifted. This keeps people from sending these items to their alts that do not already have the required privilege, which could otherwise be considered as a pretty big exploit (although they still would not be able to actually use those items even if they had them in their inventory, so this is arguable). In any case, each person has to earn their way up to the top items, no matter how much cash or in game gold they have; if they do not meet the requirements of each item, they are not getting it; period. Now, this is an area that is very subjective. Different people are going to view different prices as being high or low. But when we really look at it, the definition of value is what someone is willing to pay. If nobody is buying an item from the shop, Trion will have no choice but to either remove it (which has no negative impact since nobody was buying it anyways, right?) or lower the prices. The latter is the more popular option, and it usually occurs in the form of sales on purchases. This has not happened to any items yet that I am aware of, but Rift did recently move to the free to play model so it is possible that they just do not have a good lock on what is good and what is not. Now, the prices for the Rift store credits themselves are pretty awesome. The least you can buy at once is only five dollars worth, and you can also get the trade able credits for ten dollars. Why is this great? Because it gives a pretty cheap entry in to getting involved with the cash shop, and it also gives a cheap way to start buying some gold (by trading the coupons). The effect of this is that many more players will be buying items from the shop, and as we have already seen so far, tons of people are willing to sell their coupons on the market. While we are still waiting on prices (in gold) of the coupons to start evening out, it looks like we are getting pretty close, with the average ones running at around a thousand platinum or so. So essentially right now a hundred platinum is worth a dollar. One of the coolest additions to the cash shop is the ability to unlock the extra Storm Legion souls. Merge this with the unlocking of extra bag slots and character slots and you really have the ability to get access to the entire game without having to spend a cent (or, alternatively, you can get the cash shop credits and use those to do it). The game this reminds me of the most would be Guild Wars 2, where you can buy the normal version of the game and then through trading for the gems you can then upgrade your game to the collector's edition. In a sense, that is what is going on here as well, although you do not get the collector's edition bonuses when you do this in Rift. The reason for adding these items, though, is likely because of promotions they ran in the past. For example, on Raptr (a social gaming application that rewards you for playing different games), they were offering up a free copy of Rift when it was still on a subscription model. All you had to do to obtain this free copy of the game was to play the trial version for five hours, which was no problem since even in the trial, there was plenty of content there just between the levels of one and twenty. Even if you tried to rush your way up to level twenty, it would take long enough that you would have either unlocked the free Rift game by then or you would be close enough that it would not be an issue. Later on there was apparently also another promotion using Raptr, where you could get a free copy of Storm Legion. I did not personally see this one or take part so I am unsure how accurate that is, or what all was required for it, but I have heard about it enough to believe that it is true. 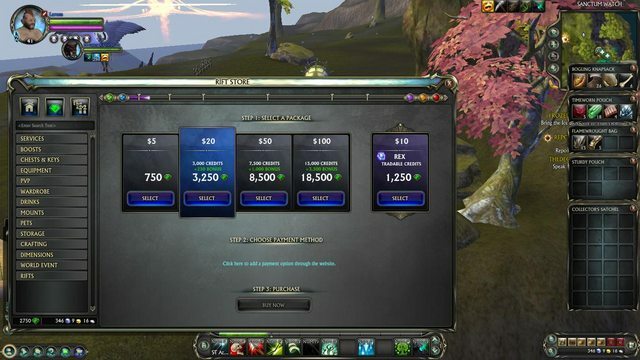 It is worth noting that in the case of both of these promotions, they happened soonish (a couple months or so) before Rift announced that it was going free to play, so it is entirely possible that this was Trion's way of trying to get new players in to the game in the hopes that they would continue playing and then their subscriptions would keep them from having to go to the free to play model. Sadly, this does not appear to happen, but Rift has been revived due to the change so it is also a good thing! While we have started hearing a little bit about Rift 3.0, we have not gotten any information about how the game is going to be handled. For example, some free to play games end up charging for expansions (like Lord of the Rings, and Guild Wars 2). While Rift did come with Storm Legion's zones unlocked for the free to play version, it is hard to say whether or not the same will end up happening when 3.0 is released. I would think that at least the new lands would be open and they would do something similar to what we see now, where you pay only for the new souls, but I guess that all depends on how successful their current model has been in terms of their income; after all, Trion is a company and if they are not making a profit they will be forced to either make some more changes to their model or start taking the game offline. We do not want that, and they do not either. If anything, I am remaining hopeful that they will add any new Rift 3.0 features to the cash shop so that players with excess platinum can obtain them that way, rather than having no choice but to purchase them. This would follow along with the current way of handling things, and I really love and support the idea behind it and want to see it continue to flourish! While the biggest fear that people have about Rift's free to play model is that it is now a pay to win game, that is far from being the truth. It does not matter how much money you have, because you will never be above the other players in terms of progression and gear unless you earn it. While some pretty nice items can be bought from the cash shop, these still require that you meet all of the requirements such as notoriety, so that really does not make any difference. If you already had the ability to get that far in to the game, you are more than capable of purchasing the items on your own regardless as to whether or not they are on the cash shop. The only difference here is that you are being given more than one option as to how you want to handle the purchase, rather than having to rely on a certain currency or upgrade structure (in the case of PvP gear). More options are always better, as long as they do not decrease the prestige of the items, and in Rift's case, they do not. This makes the system perfect just the way it is, and I am looking forward to see what they have in store (no pun intended) for us in the future! If Trion keeps running Rift the way they are, I think I will end up being pleasantly surprised by what we see next.